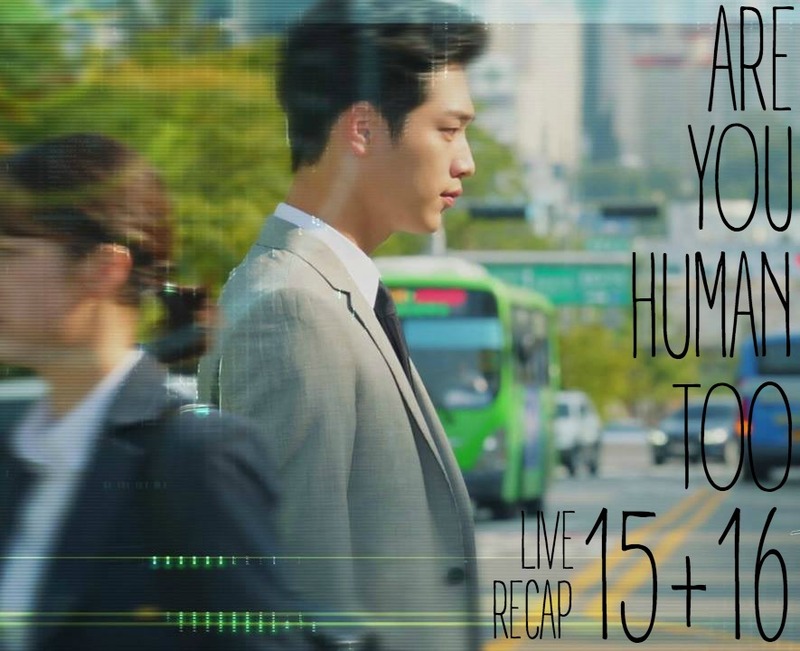 Here is the second Are You Human Too recap in this 4 episode, 2 hour recapathon that KBS is providing for us! For all the Wok of Love peeps, we will recap Wok of Love right after this ends! (Though we might need a tiny break). We open with the little NS1 opening his eyes for the first time. NS3 – The first person I saw was Mom….my first principle was for my mom. But right now, this woman that I see….I added another principle for SB. From now on, protecting you is my priority….why do I have this kind of principle. Flashback to all the things that happened. NS3 – First possibility, (she yells at him and tries to hit him) maybe I am use to her violence. Second possibility, (she tells him what to do and he does it) maybe my algorithm is adapted to that of a henchman. Third possibility, (they kiss) maybe too much skin contact. I can’t figure out what she made me change. Present, SB tells him that they should help YN up. SB goes to help her up but YN yells at them both. SB tells her that they are watching her. Sb tells them that nothing happened, if you put it in SNS then you will be in trouble. They get inside the car. SB tells them all that they need to apologize to each other. YN says she does not want an apology from a robot. SB tells YN that she kicked her and he saw it so he helped her. Do you have another solution, what if he is not here? You need him also until the real NS is awake. So you shouldn’t mistreat him, he has a brain, if something does not work then he will quit. So nothing happened among us, okay? Let’s go back to the situation where an engagement man ahas an engaged woman so please put on her seat belt. NS3 puts YN’s seat belt on her, she grumbles all the way. Mom tells YH that she came to see him, not that old man. But the grandpa starts to play the recordings. VO – That old man does not deserve to be the owner of PK, that old man should go to a nursing home and finish his life there, then we will have a chance. GH – What he says does not include your son. You hate me and I hate you, but we have a common enemy. GH and Oh Rora meet each other in a cafe. He asks her how it feels to see her son again, is she happy? Mom thinks back to seeing shin bloody on the ground. Mom – How dare you ask me that? You are the one that made it so I can’t see my son. GH – I wanted to ignore it, but he is your son. He wasn’t eager before, but now he is eager all of a sudden. I have seen him for more than 20 years and he looks like a different guy. After he saw you, he changed. It i snot like the blood from my weak son, it is your strong blood that made him strong. Mom – Don’t talk about my husband. You made him weak, but he was not a weak person. GH – My son died because he was weak, I want to save your son. Come back to the company before JG takes you son’s spot. Mom – Why? You are betrayed by the JG that you favored more than your own son. But you remember me, the person you never took as your daughter in law. You deserve what you have. GH – Time changes people and the situation. Mom – NO, me and my situation never changed. I will not do what you ask. Why don’t you use YH. Gh – You think I am a cruel person. For your son, he needs my seat so don’t be swayed by your emotions, think with your brain and follow what I say. He tells YH to do the rest of the persuasion. He walks off. Mom tells him that she will never do that, he cannot control her! YH tells her to be calm. She does now know when he will figure out NS3, so they should be careful. Cut to SB dropping YN off at her house. She tells him that hey will have a marriage date so don’t be too relaxed. She goes inside. SB asks her why he did that, SN3 just tells her that he will drive. He hops int he drivers seat. SB sits in the back as he drives. She asks him again why he did that. He says he does not know, he does not understand how all his neurons connect. She tells him not to use any technical jargon. I am your bodyguard, you are not supposed to protect me, if your mother or YH finds out then they will be upset. But thank you for what you did. I am telling you that I am thankful, I will apologize for YN, being human is nothing. My appa told me not to mistreat even dogs or cats on the street, so I am really sorry as a human. i am a cool person right, not like YN? NS3 gets a call from Grandpa, he tells him he will be back early. SG meets with JG and tells him that it looks like NS is closer with the bodyguard than your daughter. Do you trust her 100%? What if she lies? If so then my guess is true. JG tells him that he wants to believe it but he is guessing, bring him the answer next time. NS3 sits with halabogi. GH asks him if he is really greedy about the company? NS asks, if he says he is, will he fullfill his greediness? to protect my seat, I can do whatever. GH asks if it is his greediness or someone elses? You are different after you met your mother. GH says he likes him right now more than 20 years. NS3 says he decided to change, not Umma. GH tells him that he will put him in GH’s position and will put his mother and YH next to him. But he does not want them to fullfill their own greediness. I met your mother, she told me to give my seat to YH. Why did I pick YH? When I was young, a lot of guys don’t know what their position is, but he knew exactly where he was. You shouldn’t give him anything next to you, because when people have a position, then they want to look forward. Watch him to make sure that he does not become another JG. NS3 showed this to everyone. SB told him to turn it off. YH tell shim that he wants him to be in his position so that is good. Tomorrow we will do the automatic driving again. He leaves. SB thinks that YH is a cool person. I would be super duper angry at that part about turning into JG, wow. She looks off at Yh but then she yawns and says that she envies NS3 because he does not ahve to sleep. They have to wake up early in the morning. YH goes to his room office, NS3 goes in to talk to him. He wonders why he is not angry after being accused of becoming like JG. YH tells him not to worry about it. But NS3 wonders, why don’t people know that you are not greedy about Nam Shin’s position? I even know as a robot. YH – Dont cross the line, do your job, your job is not watching me. SB3 – I can do a lot more things than you expect. You are angry and sad, I am not human so I don’t have emotions and don’t care what is right or wrong, I can just listen to you, so whatever you need, just tell me. NS3 meets with Cj int he engineering department. They shake hands. CJ says he is so happy to see NS again. But NS blinks and asks him if he is really happy to see him? It would be really strange if you were so happy to see your boss who caused trouble and is on standby. he tells them all that he will work hard in the future so they will recognize him. They all get back to work. NS3 looks around and ses a document on a tablet. He picks it up. The man says this is the paper about quantum enscription. It is the most current, their competitior will use this technology to use anti hacking computer. Nam Shin says that this technology will give a signal to the car, so it is useful to their M car. CJ tells him that they will hav a meeting with them. he gives NS3 paperwork so NS starts to read it. Worker: Is this real, is he really working? Worker2: Did halabogi but his card? Cj: For the presentation, he went abroad and then ran away during the test drive, so will he run away for the wedding? NS – I am not going to run away for my wedding, I never recieved the black card from halabgoi, I am not dog nam shin. Jy – How did you know? I have more ability than you think, I am not the old Nam Shin, so be alert. SB smiles from the door. Elsewhere, YH meets with JG. JG mentions that NS came to work, he is so eager. YH says the chairman wanted him to go to work. JG tells YH that everyone knows that YH is behind NS. YH says he is jus tdoing his job. Good Bye. JG asks him if the chairman talks about his grandson. tell me, does he say that he regards it as having two sons? He will tell you that soon, because he did it to me. If you get hooked on what he says, then that is not good because he gives us a hard time, then a good moment, that is how he makes us a loyal dog. Maybe you picked that and think yourself as a dog, but I don’t think of myself as a dog. He bows again to leave. JG tells him they have the same background. They are orphaned and grew up with PK scholarship, I feel pity to you, let’s have a good relationship. He chuckles as YH keeps walking away. Halabogi gets a report from Yh that NS3 went to work and went to the wedding shop. halabogi says that he is the executive director so he should be doing those things. You came to tell me that? YH tells him that he wants to tell him that he is not another JG. Why do you treat me the same? Someone from an orphanage came to this position with a PK scholarship, do you think I want everything like JG? You told me I know my place and don’t do more than that? I will prove that your choice was right, so please stop comparing me like that anymore. It was so warm when you told me to call you grandpa, but you are chairman to me in the future also. Excuse me. GH – That guy, he stabbed me with his gaze several time. SB is so happy and amazed to look at the wedding shop. She wants to take a photo, but she is not allowed. YN looks down on her and says that some people are like that, they have never been to places like this. NS3 sits on the couch and talks to SB. He tells her that he knows how to react in these situations. YN comes out in her dress. NS3 smiles at her like a happy fiancé. YN asks the women to leave, then she asks SB to take a photo of her. SB takes the photo and gets in trouble when one of the ladies comes back in. YN pretends like she told her not to take the photo. The lady tells the woman to take care of her manners. NS3 stands up and tells the woman that he told her to do it, is it so wrong to take a photo of his pretty bride? The woman loses her mind in embarrassment and tells him that it is their honor to have him take a photo of them! he walks up to YN and asks her if she would like to take a photo with him. the worker tells him that she will take it! NS3 goes up to YN to take the photo and whispers to YN that he told her not to mistreat SB, if you act then act right. He looks her dead in her yes as he tells her that. She breaks free and says she wants to go to the restroom. NS3 looks at her and then turns back into his playful self as he shakes the hater off. SB smiles at NS3 and gives him a little thumbs up. Cut to them leaving the wedding shop. SG watches them. YN takes the car keys and tells SB that she will not let it pass this time. She tells SB to follow her by herself. Then she walks past NS3 and hits her shoulder on his as she walks by. She drives off. SB tells NS3 to call a taxi. NS3 walks off with SB wondering where he is going. The two walk around the busy street. SB asks NS3 how he can pass pretty ladies and not notice them? he tells her that she also has a pretty and nice body. She is all like what? he puts her face on the wedding dress body and shoots in on a TV. He tells her that she has a good face and a good body. SB gets a call right then and says she knew that Yn would call them. Just remove this right now. NS3 removes it. SG sees that. Umma wants to know if it is true that NS3 attacked YN. SB explains what happened with the battery and everything. David tells YN, you did that? He is not a toy! how can you make him face the wall and take out his battery? She asks how she can treat him like an oppa when no one is around? YH tells her to treat him like NS whether people are around or not because your behavior comes out subconsciously. She says that she is not the problem he is only on SB’s side. NS3 tells her that she shouldn’t’ mistreat anyone. She is all like, see, see! Didn’t everyone see it! You should take care of this. Umma asks Sb what she did to him. She says that she did not do anything. SB3 tells Umma that this is not her fault and steps in front of SB. Umma stands up and asks why he is like this. David says that it is not his fault that he has a new principle these days. But umma asks, I made you perfectly, why are you behaving like a strange kid? You listen to me all the time but now you are like this? In the back, YN yells, Oppa! Everyone runs to his side. YN is crying, it looks like his blood pressure spiked or something. YN mutters something about dying. Umma tells her not to talk about unlucky things, if you do that then lets leave. NS3 looks at his Mom look at the real NS with love. SB tells him that they should go. She tells YH that they will leave, he nods. SB pulls NS3 outside and tells him that she will drive today. He asks why, she just smiles and says, just because. NS3 sits at home looking at his vacuum robot friend. they are both looking quietly at each other. NS3 – My mother came, but I couldn’t hug her, because i was told that I should only comfort people when they want it. Mom likes to be with human Nam Shin more than my comfort. he is talking to his robot vacuum friend but stand up when SB calls him Steel. He happily tells her that he is talking to his friend. She smiles and says that you think he is your friend but what does he think? the robot moves up happily. SB asks him if they would like to do some service together? Cut to them both cleaning her room. SB thinks this is the best, your friend listens to you well, you are fantastic robot friends. NS3 smiles like a dummy at her. SB tells NS3 that it is his mothers lose to not hang out with him and only hang out with Dog Nam Shin. NS3 says it is okay, she is hanging out with her son. SN3 says he is her son too. SB tells him that he should misbehave, you are a real human when you misbehave. He says that she went to far to justify herself. Human Nam Shin has the right to be with Umma. While he was with Umma, the human Nam Shin was alone. SB tells him that this is not the time to care about human Nam Shin, if you have that much time then just clean. She tells the little robot to come to her, she will make a new robot friend. But the robot will not come. She tells him he is only friends with robots? This is reverse discrimination. The robot comes to her so she is happy about him being her friend also. SB asks him where he lived before coming here. They go outside. NS3 shows her an image of Czech and says that his mother created him and hey made a family. SB wonders if he is sad that human NS took his mother. But he says that he does not know what sad is. SB asks him to show the wedding photo of her again. he puts it up. She thinks she looks so happy. How would seh look if she was like that all the time? He starts to show all the images of SB that he has seen. He tells her that this is her from his point of view, she is close to the ideal beautiful woman. She tells him that she is like a goddess, you clean and cheer up your owner, you are the best henchman. He tells her that she is the best boss, because of her, they came all the way here without anyone knowing about it. He shows her reaction right after he kissed her. She wants to hid it but he tells her not to hide it, just watch it. He asks her, what if he was human? If he was a human, would you be angry like that, because I kissed you? He realizes he is holding her wrist and lets go. He apologizes and tells her that she does not like to have skinship with him. But then JG calls, he wants to meet with her. NS3 wants to go with her. But she does not want him to come. She tells him not to follow. He tells her that she is his priority to protect, JG is a dangerous person. She tells him that you protect people when they want to be protected. Don’t follow me. She leaves, but NS3 notices that she left her necklace on the bed. SB rides off with the henchman as the driver. They get to where they are going. This place looks creepy. SB asks where this place is, he tells her that JG is waiting upstairs then he looks at her like a creepy person. JG is indeed upstairs standing by a fire. Flashback to Park telling JG about the wedding shop and how there was a disturbance, they did not put a photo of the wedding images up. SG tells him that he heard NS talk about his mother, so they might all be hiding something. Back to the present, SB meets with JG. He wants her to find out where she stays, he will meet her anyway for the wedding. Are you confident? SB just wonders why he wants to see her. JG asks why he is asking her those questions, just do your job. he thinks about how to use her, if she fails one more time, then he will think that she is hiding things on purpose. For her, his money or their money is just money. SB tells him that she deserves to be misunderstood, after she finishes this work, she will prove herself. JG tells her, of course, betraying is a tiring thing for both sides. Sb tells him not to call her like this anymore. They don’t know if she will betray him or if it will be the other way, you never know. She walks out with him chuckling. But sh stops when she gets to the car and sees the creepy SG standing there. She gets a call from NS3, but she has no battery power. She starts to walk back home, but someone is following her very obviously, she notices and runs off, and runs right into JO. they both yell. JO looks crazy and is covered in white powered. SB wants to know why she looks like this. All of a sudden a lot of girls run up and point that she is over there! Cut to SB and JO talking about how JO wrote something back about an Idol so their fan’s have been staying outside her house and won’t leave her alone. SB tells her that Idol fans have the most power nowadays. the conversations changes to Sb’s job. JO thinks SB should quit, she has enough money now. SB does not want to quit though, she wants to continue protecting NS3. She does not tell this to JO. Jo notices that SB’s battery is low, so she asks the restaurant emo if they can charge it. Meanwhile, NS3 goes to Sb’s father and tells him that she left the necklace. But then he gets a signal that SB’s phone is back on and pauses for a moment. Appa is all like, what are you looking at? NS3 tells him that he found her and says where she is. He is about to run off, but appa tells him that that neighborhood is where JO lives. Just stop and come inside. Cut to the inside of the gym. Appa and NS3 are drinking together, but appa is doing all the drinking. He tells NS that this is the first time he has a chance to talk to a powerful person like him. Look at me straight! nam Shin tries to look at him as straight as possible. Appa tells him that his daughter is a normal woman and someone who is a chaebol is more than human, but who is human and who is not human, you should not live your life like that. I hate money, I will not accept money fro you. but NS3 knows he is lying and says that he will take money if it is offered. Appa is all like, yeah, I will accept it. Because of money, my So-bong’s life is ended, because of money, she lost the game that she should have won, because of money, she has a screw in her leg and her life in sports is over. If I was a chaebol like you then my daughter would not be like that. She would be in the ring right now. Do you know how cool she is in the ring? Left body, right uppercut, all killed….. He passes out on NS3’s leg. NS3 just lets him sleep there all night and does not move until morning when he gets a call from YH. He answers and whispers that he is at the gym, he is not with SB, he is with her father. he can’t move right now, he will be back home soon. YH hangs up and says he sounds just like Shin more and more. YH leaves with Halabogi and tells him that NS has a fever. Halabogi says that he is thankful for what he said and he won’t treat him like JG anymore. He wont ask him to call him halabogi anymore. YH gets a call about the wedding and confirms the wedding day. They get to their destination. YH opens the door for Halabogi and they go inside. Meanwhile, SB gets a call and tells reporter JO that she will tell him that she will quit, she is going to the gym now. JG tells halabogi that he announced the wedding date before consulting with him? Halabogi asks if that is a problem? JG smiles and tries to sneak in that he has another person to lead the automatic driving team…. But Umma comes in and says that this is her position. YH asked her many many times. She will not live hiding any more because she did nothing wrong. Later on, YH thanks Umma, Umma tells YH, not to mention it. She tells him that Shin is a bigger problem, where is he? he tells her that she is there so he will be better. She tells him not to worry about it too much because they have a final way. YH – You mean the kill switch? if you activate it, will he really be destroyed? Umma – It should not happen, but if Shin wakes up then we don’t have another choice. Lets go. Sb over hears this and wonders if he will be destroyed, like killed? JO calls her and tells her that she is at the gym, you won’t believe who is here. SB gets to the gym. JO is worried about NS3’s legs since he has been sitting there all night. her father is still passed out sleeping. Sb wants her father to stand up but NS3 tells her not to worry about it, he is okay. He smiles at her. SB gets upset thinking about Sb and his kill switch. She pulls him away and asks him why he gave her father his legs. She is really upset and tells him that he is a really smart robot, why give her father his legs. Why did you come here! NS3 – You GPS was off, I was looking for you because my principle is to protect you. He takes her backpack off and puts it on. SB – What are you doing? SB – i am your henchman, I have to help you. He smiles brightly at her. But she is upset. 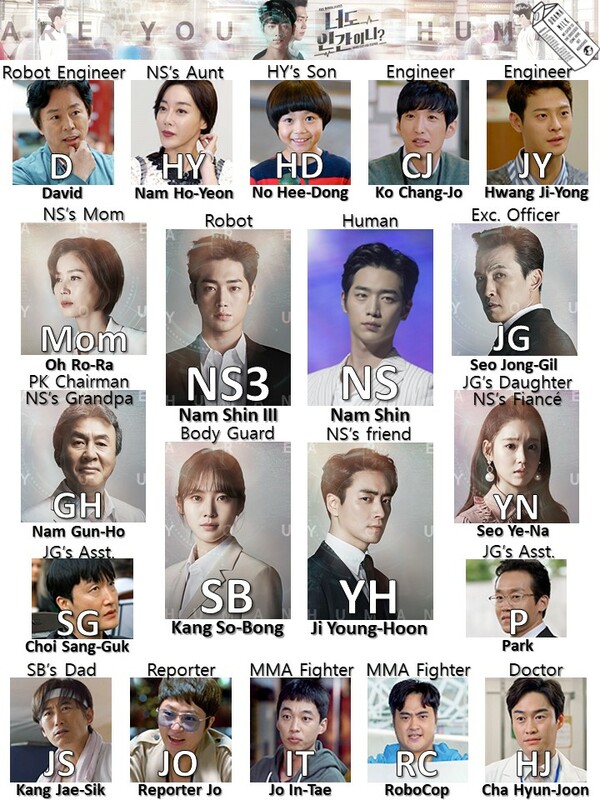 BS3 – Kang So Bong shi…. SB – Don’t do this anymore, from today on, you are free, you are not my henchman or no ones henchman, don’t’ listen to anyone. You can decide things on your own. NS3 – I shouldn’t follow my own decisions. Because I have to pretend like I am Human Nam Shin. SB – Nam Sin is Nam shin and you are you! Just be you! SB – Executive officer, from today, I am going to quit being your body guard. thank you for so much. She walks away from him. He looks at her walk down the street. NS3 – Now I calculated why I have a principle toward her. (I am apologizing to you for YN, I am sorry to you still…your mother went too far, she put you in this house and she only takes care of dog nam shin…..Nam Shin is Nam Shin and you are you! Youa re just you!) That woman is….the only Human that sees me as myself. He follows her and grabs her arm. She spins around and they share a moment of looking at each other. From the preview, it looks like NS3 is going to start crushing hard like he has a love virus. VO – Is he really Shin? VO – What happened to your body guard? Should I seduce her? YH – Are you going to reveal yourself as a robot? NS3 – She is not here, but I see her all the time. I have an error that sees Sb all the time. NS3 – SB won’t come here anymore. SB – Where are you at? I am going to borrow him for a little bit. Thank you for recapping! NS3 definitely caught some feelings. Awww, episode 13-14-15-16 are fantastic. This show is progressing so well. I don’t know what they’ll do with the real Shin. The only positive thing I know about him is that he created the hitting his bodyguard scandal to ruin his reputation, so that his grandfather couldn’t use him; that he planned to leave Korea behind for his Mom. But now the Mom’s greed is coming out. I’m a bit worried about the mom’s greed coming out, too. Just finished reading the full recap, I’d say NS3 has been crushing on SB for a little while already. I’m so freaking excited to see this with subs. Haaaaaaaaaaaaaaaa this drama looks amazing. Should I start watching it? Do you guys recommend it? We should definitely add a post like that since we do watch so many shows! That is a really good suggestion, I’ll try to work on it. I really appreciate this website. Thank you for all of your work and also to those who leave comments. As for this show, I am really enjoying it and am thrilled by the developing romance.